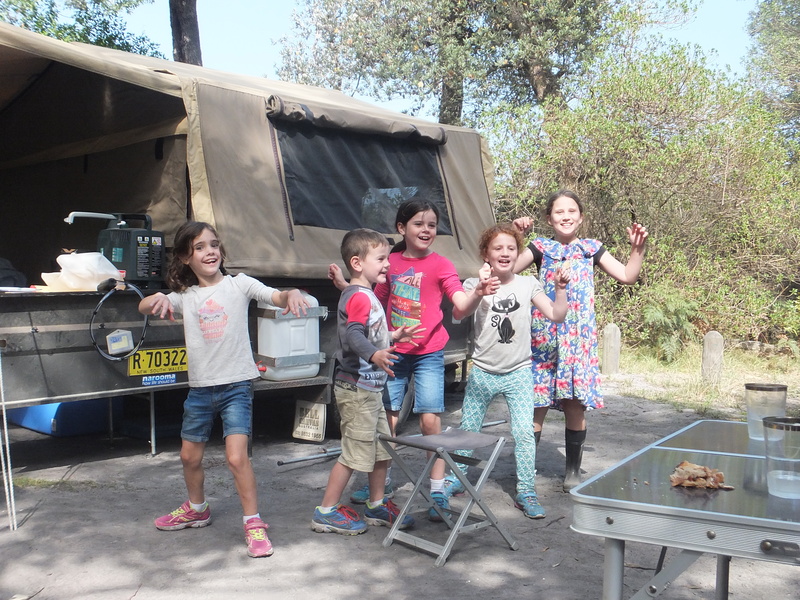 Over the Easter long weekend we finally visited Cape Conran in East Gippsland. I say finally because my friend has been going there for 14 years and has asked me pretty much every year to come along but for various reasons we just haven’t gotten around to going. What a mistake, big mistake! This Easter it turned out that we were heading down that way (sort of!) 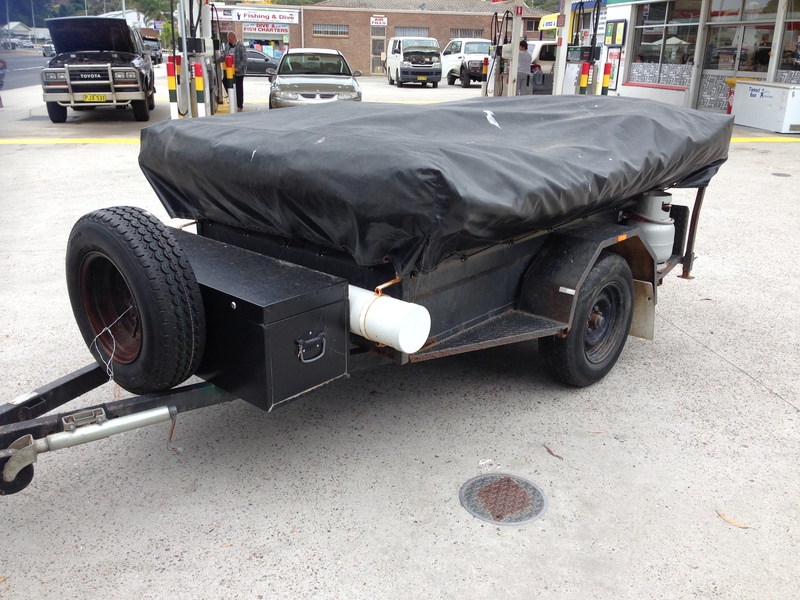 to pick up our camper trailer. We’d bought it on eBay for an awesome price, the only issue, it was in Narooma on the NSW South Coast, a 10 hour drive from our house in Melbourne. The people very kindly agreed to hold on to it for 4 weeks until Easter so we could make the trip to pick it up. Introducing the new camper! We’re going to have lots of new adventures to share. So here’s how it happened, on Easter Thursday we drove 6 hours from Melbourne to Orbost, we stopped overnight at the Orbost Motel. Got up at the crack of dawn and drove 3.5 hours to Narooma. 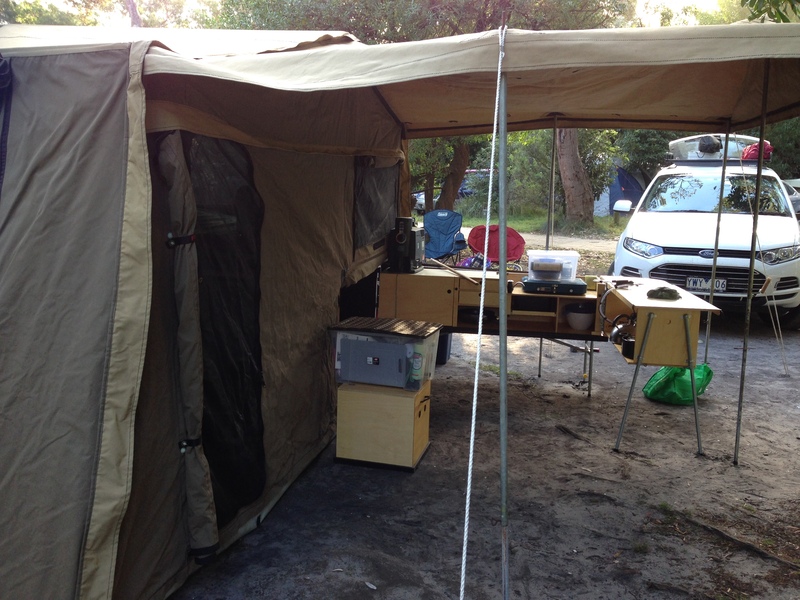 We picked up the camper trailer and headed into Narooma to pump up the tyres and then headed 3.5 hours back to Orbost. 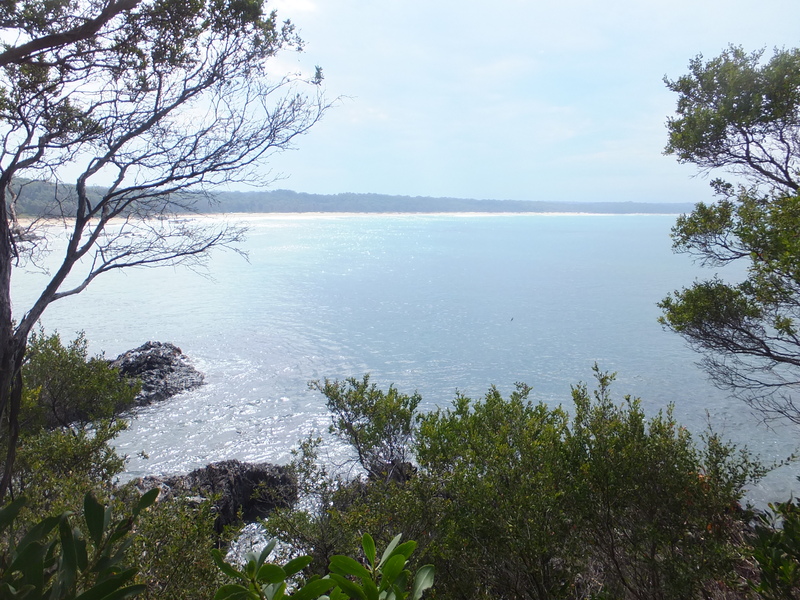 Cape Conran Coastal Park is about 30 mins from Orbost towards the coast past Marlo. We arrived at 4pm on Good Friday and started to set up. The door and the kids side of the tent. The Drifta Kitchen included with our camper. By 5pm we were set, all done and sat down having a beer. The weather this time of year can go either way and I’m happy to report that on this occasion we were extremely lucky. We had a little bit of rain overnight on the last night but it was gone by the morning and the others days were glorious. The campground was full this weekend but you wouldn’t have known there are 135 campsites. They are set into the bush and no further than 50 metres from the beach, from which you could hear the crashing waves. There are flushing toilets but that’s the extent of any luxuries! What it lacks in luxuries it makes up for in leaps and bounds in scenery. I did struggle with having no showers but I think if we return at Christmas I will purchase a camp shower and pop up tent – problem solved! There is only bore water onsite so drinking water needs to be carried in as well. Our hosts, Carla and Josh, have managed the park for the last 17 years and are doing a fantastic job of it, they are extremely relaxed and add to the laid back feel of the park. They work very hard to keep the park at the high standard that it is and talking to them its not hard to see that they really love this area and have loved bringing up their two kids in the Cape Conran community. On Easter Saturday we went to the Marlo Primary School fete which is an annual event over Easter and where Josh and Carla’s kids go to school. Not only has Carla managed one of the busiest times of year in the office but also managed to bake an amazing amount of treats to sell at the school fete – what a champion. After the fete we had a quick lunch and then headed off to the beach to attend the annual sand sculpture competition run by one of the campers. Lots of the kids were out and enjoying the sunshine and participating in the competition. There were some great efforts particularly ours that was built by Josh, Craig and the 5 kids. Ours was pretty impressive but failed to win on this occasion! 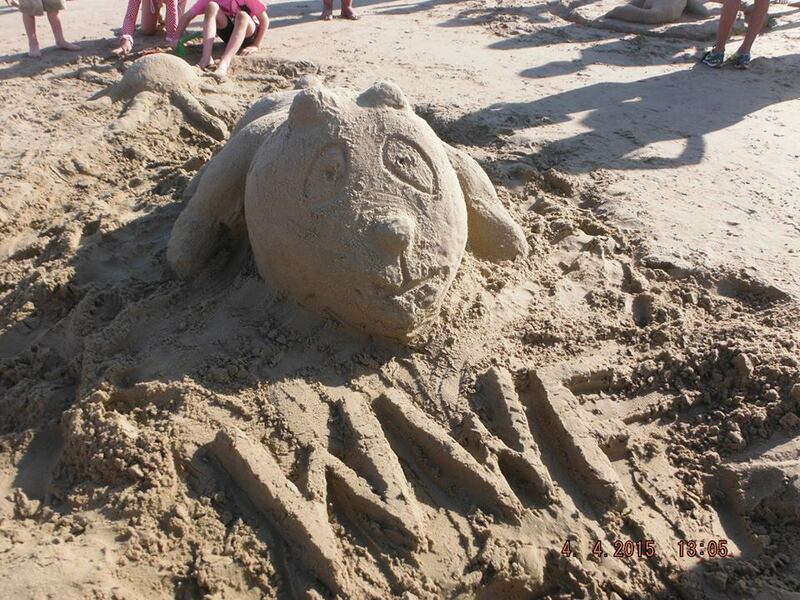 Our panda sand sculpture, impressive effort! The following morning, Easter Sunday, the kids gathered in the activity centre near the office for role playing. They prepared a Channel 7 news segment and they all played a specific role. They rehearsed it for all the adults and we enjoyed seeing that they had been busy and having fun together. Channel 7 News report, music and all. This is the place you have to take the bikes for the kids. There is no where for them to go so they are safe to ride off together and have fun. Our kids stuck together and come back when they were hungry, just like we did as kids. All the kids had bikes and were out and exploring and having fun. 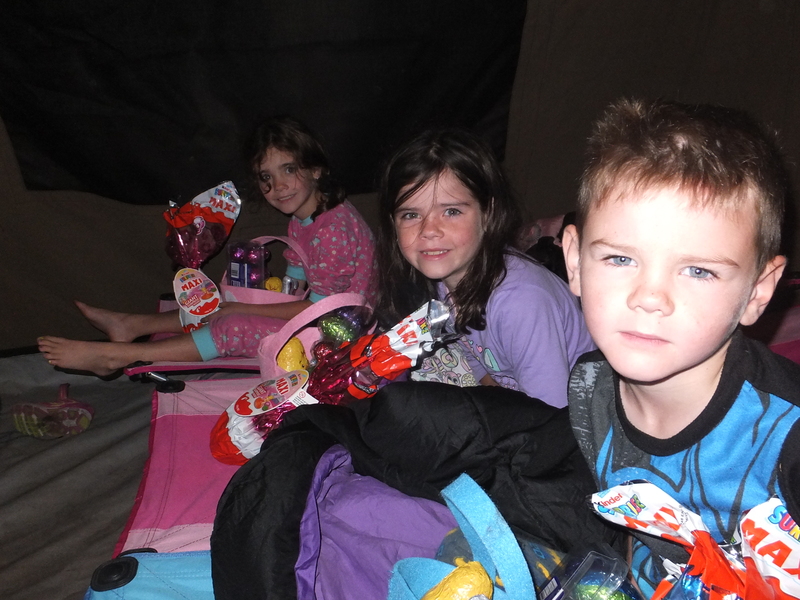 It seemed the Easter Bunny found each and every kiddie in the camp site even though our kiddies forgot to leave a letter explaining where we were, lucky for them! The Easter Bunny found us & Caelan is still half asleep! Easter Sunday was warm and sunny and very still. We took the opportunity to take a walk around the Cape and get the kids out and about. We took off down the beach and over the Cape and round the other side. 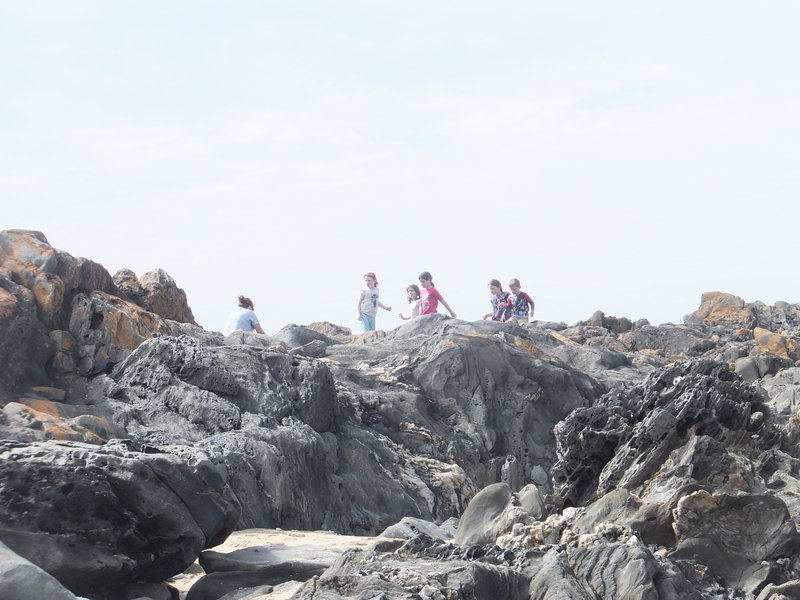 The kids enjoyed climbing over all the rocks and looking for sea animals. We found loads of sea snails and some pretty impressive shells. Keira tried to bring back half the beach, luckily she had no pockets and had to use her hands for climbing so I managed to get her to return most of it bar a couple of pretty shells. We walked back over the Cape and down the back of the camp site. I got a few lovely shots of the coast line as you can see below. Hiking round Cape Conran & having fun! Having fun with new friends from the campsite. 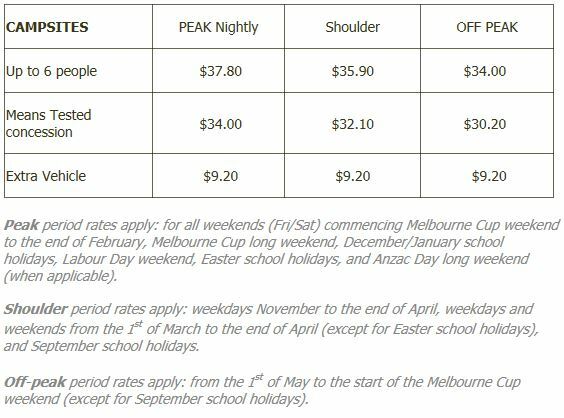 Cape Conran Coastal Park is owned by Parks Victoria which keeps the prices very reasonable even during peak times. 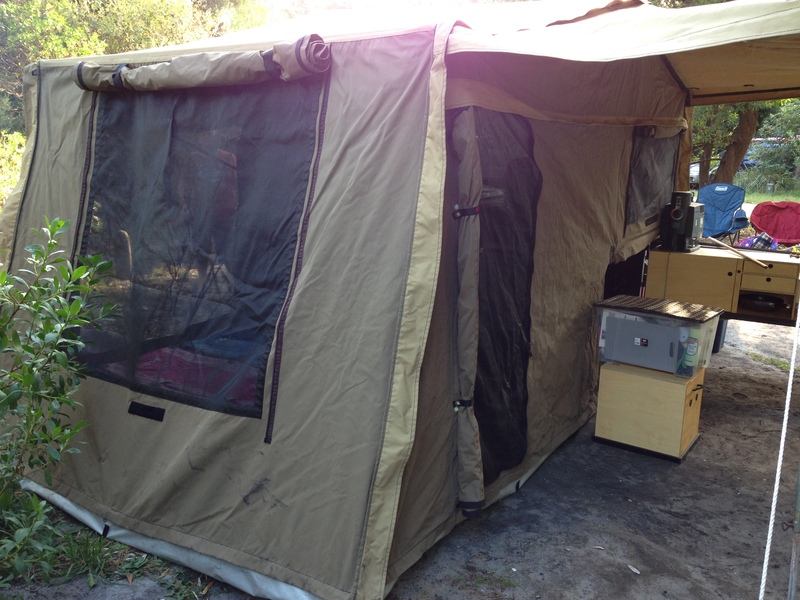 Campsites allow up to 6 people on each site. The sites are generous in size and well located in what you could call a court arrangement. You don’t feel at all like you are on top of each other. There are also areas at the end of the park where you are able to take your dog. Dogs must be on a leash at all times though and at your own risk as there is plenty of wildlife around including snakes, goanna’s and bandicoots. 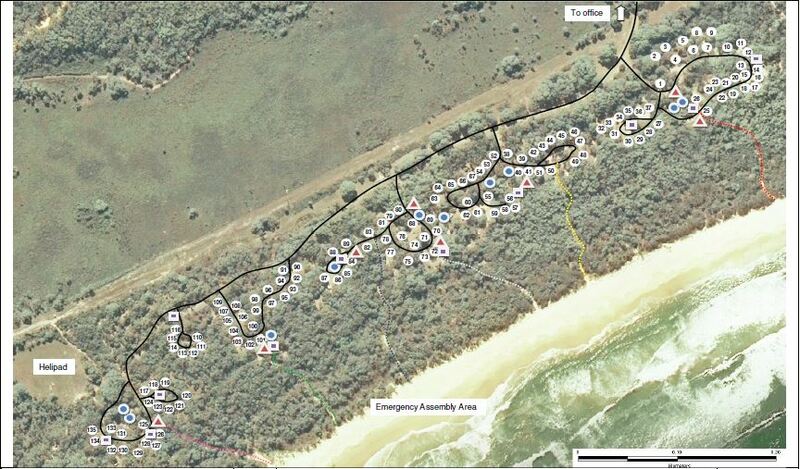 There are 135 campsites, 7 cabins, 1 lodge and wilderness retreats located at Cape Conran. You can click the link above for all the details on the types of accommodation and prices. They are all very reasonably priced for what you get. We had a great time at Cape Conran and so disappointed it took us so long to discover it, especially when I have been told for years. We will be going back there, even the kids are saying can we go there every weekend! I just wish it was a little bit closer, not that its going to stop me now though! Phillip Island is also in Gippsland so if you have extra time to kill drop in and watch the penguin parade. 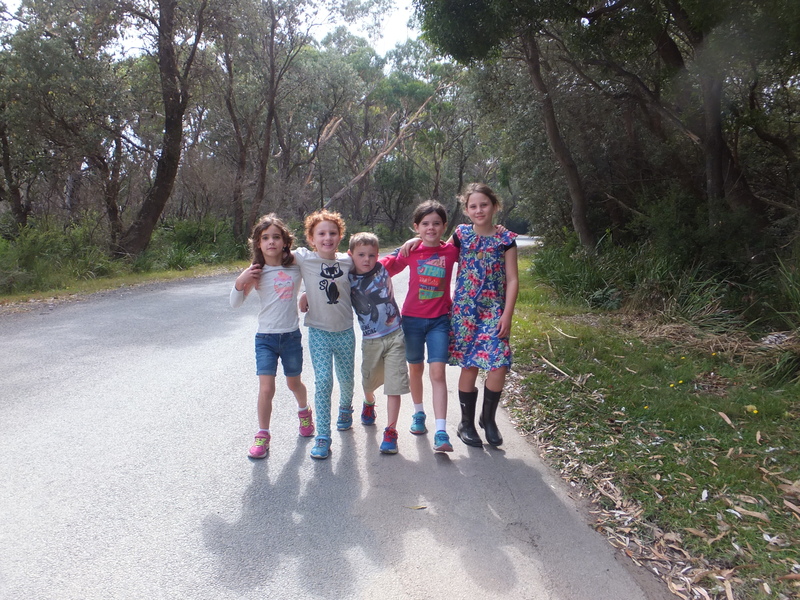 We’ve been to Phillip Island a number of times and we find it a fantastic place to take the kids. Sounds awesome! We have shells EVERYWHERE because Avah loves to collect them too. She makes necklaces out of them. Sounds like you had a great time. We did! We had a great time. It’s a really beautiful spot. Craig wants to go back at Xmas but I have 2 major issues 1. No showers & 2. Most importantly, there would be plenty of snakes. If I saw a snake I would wet myself, not kidding, I’m terrified!